For an explanation of what a BarCamp is supposed to be, try this Wikipedia page. BarCamping shares some roots with Open Space methodology: there is no agenda in advance. Everyone attending is encouraged to make a presentation or run a workshop, with spaces and timeslots allocated dynamically. Does it work? My verdict on that was also open. There were three sessions which I got something out of (not including my own). The first one was convened by my friend and KIDMM-colleague, Cher Devey. She asked, How do we explain to people the products that we [i.e. developers] create? Four sub-topics emerged: Training in IT applications; Documentation of them; Interface design; and (slightly deviating from the question, but relevant without a doubt), whether the application was actually designed to meet users needs and expectations. Technology journalist Arjun Jassal described an Indian government project to put an Internet kiosk in every village. This is not meeting its goals, said Arjun, because these big unfamiliar machines which whirr and blink are intimidating, and villagers have mostly never used a keyboard before. In contrast, some non-government initiatives using mobile phones have taken off in rural India. As the expression has it, What has that to do with the price of fish? Well, in Kerala fishermen who have landed a good catch phone in to several ports to see where they can get the best price for their catch (see here). Arjun's Hindi-enabled phone (left), and Isriya's Thai-enabled one. Click to enlarge. 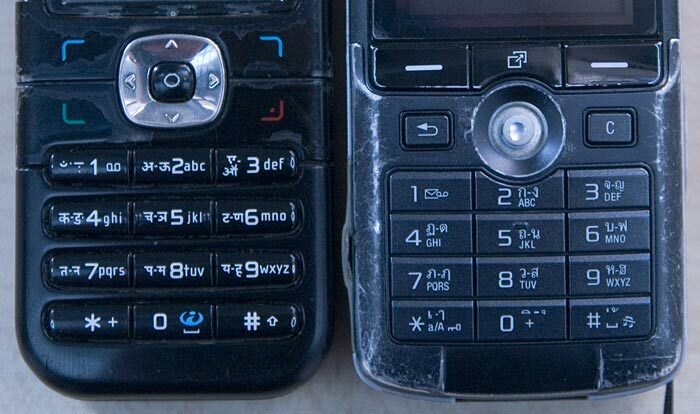 This raised the question of which languages are used for Asian SMS and how the keypad relates to that. Yes, said Arjun, of course people write SMS in their own local language, and that language is on the keypad. At which, he pulled his Hindi-enabled mobile from his pocket, and Isriya Paireepairit brought forth his Thai-enabled one. I took a photo of the phones side by side. Both these languages have more letterforms than English, so while every English letter is listed, the Hindi and Thai keypad annotations take the form X-Z instead: a range. Since Im more familiar with Thai, I can explain that the No. 2 key is used for five consonants from kaw to ngaw, the No 3 key for six consonants from jaw to yaw and so on. The star key evidently accesses the inline vowels, the zero key gives the superscript and subscript vowels, and the hash key gives the most common tone markers mai ek and mai to. I find it interesting that this imposes a further requirement on the user: to know the order of their particular alphabet. Thus maw, raw and law are all accessed by multiple presses of key 7, but none of them are marked on the keytop. Very interesting. It caused me to wonder about the use of braille. Is braille a universal type set or is there Hindi braille, Thai braille etc? Has anyone ever produce a braille mobile phone handset? Carrying logic through, it is one thing to be able to send an SMS if you are blind but another to read it so is braille to send a non-starter? Could their be software to translate braille sent into voice receipt? I suppose that sensible people among you will ask the obvious question Why send a braille SMS if you can leave a voice message? Sorry. Should read “could there be…” not “could their be…” That raises another question; can you have bad braille spellers? Alan, Braille is not actually a character set at all, but a form of physical representations of existing character sets (such as English) by the use of the six-dot Braille Cell. The permutations of the six dots allow for 63 distinct characters to be encoded: the question is, which ones? For English, the current standard is Unified English Braille Code and the unification has been agreed in the last four years. Japanese Braille encodes hiragana characters, it seems, while Korean Braille does much the same thing with Hangul; but Cantonese Braille (Hong Kong) ignores Chinese script and references latin script plus tone markers to describe Cantonese phonetics. In many ways, then, “what do these six dots mean” is an issue similar to “what do these eight bits in a byte” mean. It’s a matter of local convention, that is, encoding.